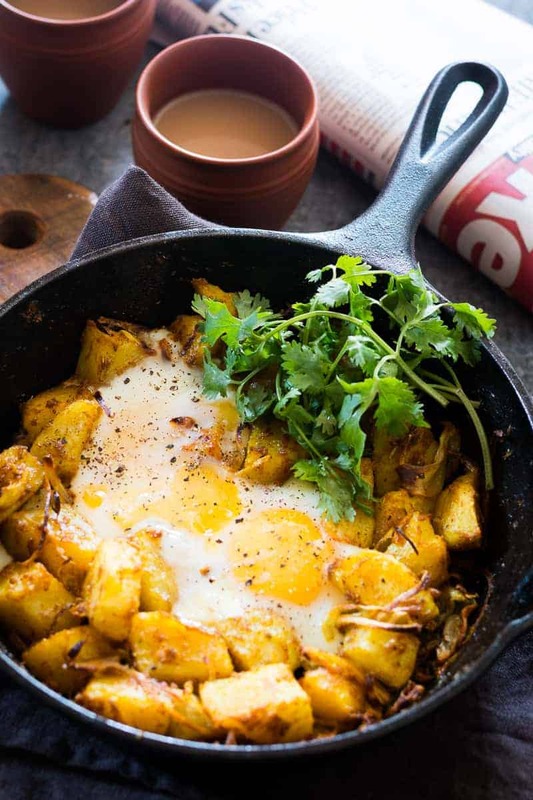 Let’s just pay attention to this spiced Indian Potatoes and Egg skillet for a minute please. Because we should always have breakfast like kings and this 15 minute breakfast is slowly becoming staple food on busy morning. I know I promised you pictures of our Raipur trip, but I’ve just been a wee bit lazy, and those are still sitting in my hard drive,waiting to be posted. 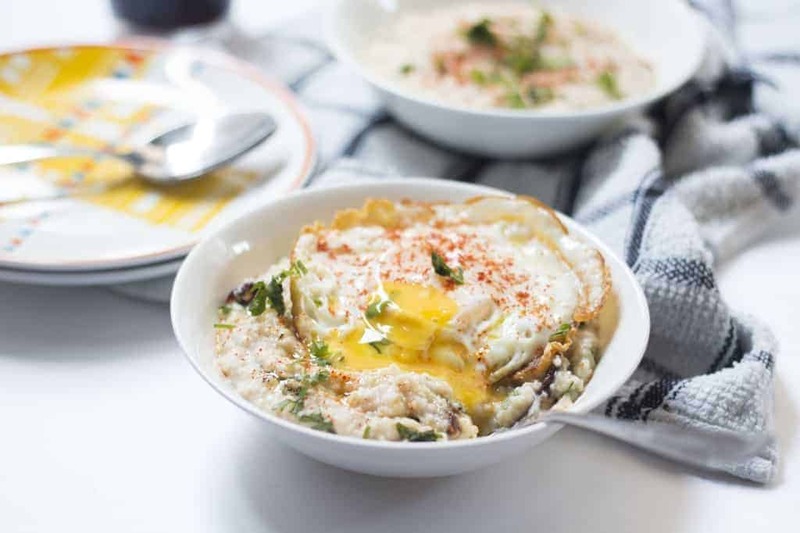 But I couldn’t and wouldn’t deprive you of a good recipe, and when you combine Indian style potatoes and eggs, you’ve really got yourself a winner! This is another one of those recipes which is perfect for your Cast Iron Skillet if you own one. I own three and love all of them! But just in case you haven’t opened your kitchen to the wonders of Cast Iron, you can use any other pan. Though I have to insist once again that when you are making these Indian potatoes and egg, a cast iron is perfect because it gives you the crispiest potatoes and a slight char on the bottom. You can also bake these in the oven and you can move your cast iron from stove to oven without breaking a sweat. 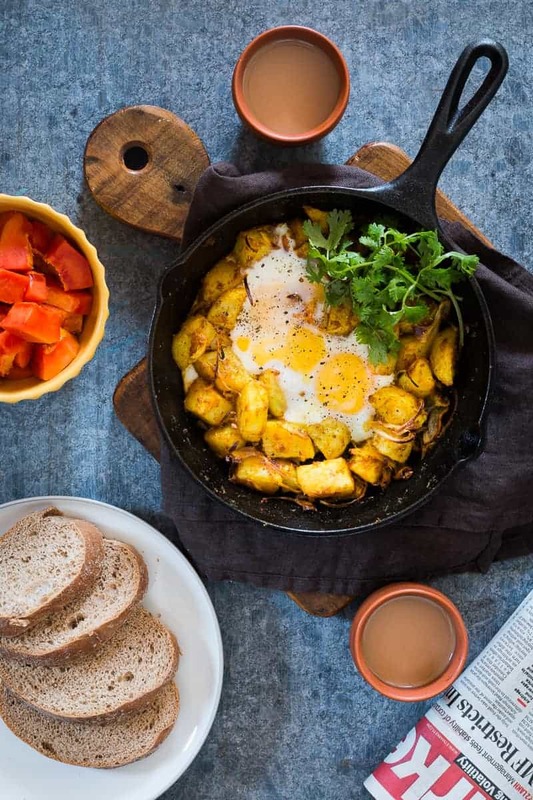 I usually end up making skillet breakfasts like this Indian potatoes and egg when we have company, which is quite often. And it’s just so fun sitting around the table sharing breakfast which everyone can have at the same time. There is no you cook-we eat business which is such a bore, and totally unfair to the cook. I make a big batch in a casserole or a skillet like this, and then we just all go at it with slices of warm, crusty bread, fresh fruit and loooots of masala chai. And you know what, I’m sure once you make this, you guys are going to get really creative with this recipe. It’s just one of those which you’ll make your own. 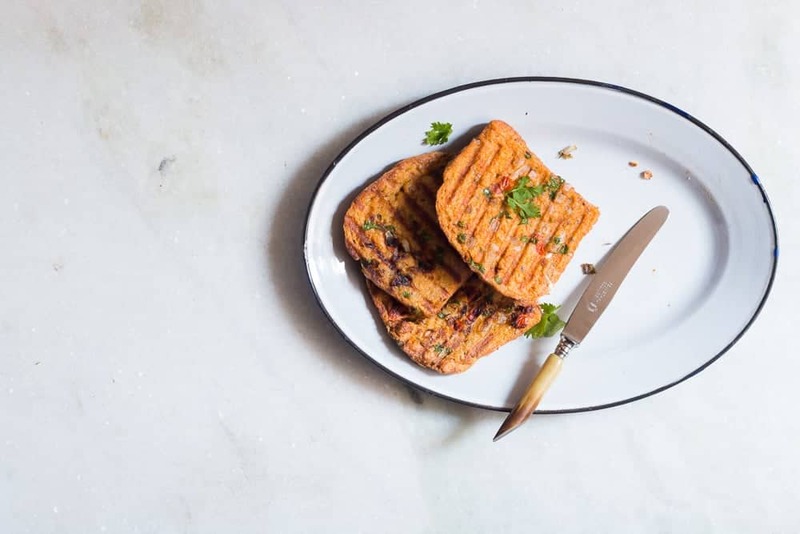 Throw in some peppers, sausages, mushrooms or paneer and it’ll become your own creation in a jiffy. Once or twice, we’ve made it with all of thooosee because umm, new flavours are just never enough. 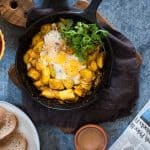 Those gooey center eggs (always my favourite) and the spicy potatoes are the best thing that’s going to happen to your breakfast world. These are totally Denver approved, which makes them twice as awesome! 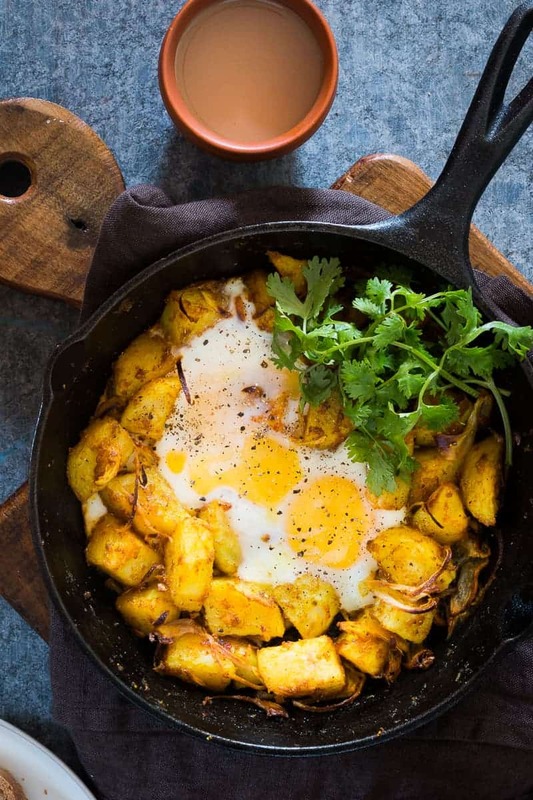 Spiced Indian Potatoes & Eggs, cooked in a skillet for a easy holiday morning breakfast recipe. Crowd pleaser, kid friendly and gluten free. Cut the potatoes into 1 inch pieces and set aside. Heat oil in a skillet and add cumin seeds. Once they start to splutter, add onions and saute for 2-3 minutes. Add all the spices and cook for another minute. Add potatoes and salt and toss the potatoes and roast them in the skillet for 2-3 minutes till slightly crisp. Make a well in the potatoes and crack eggs into it. Cover and cook for 7-8 minutes till the whites are set and the yolks are still runny. Top with chopped coriander and serve hot with masala chai. Wow, that’s looking delicious. I am gonna give it a try 🙂 thanks for sharing this recipe, Richa ! Thanks Anjali, I hope you try it out! My hubby loves eggs for breakfast. I’ve got to try this! It’s late here, but the title in the subject in the email made me so hungry I had to click through and check it out. The photos made me even hungrier ???????? 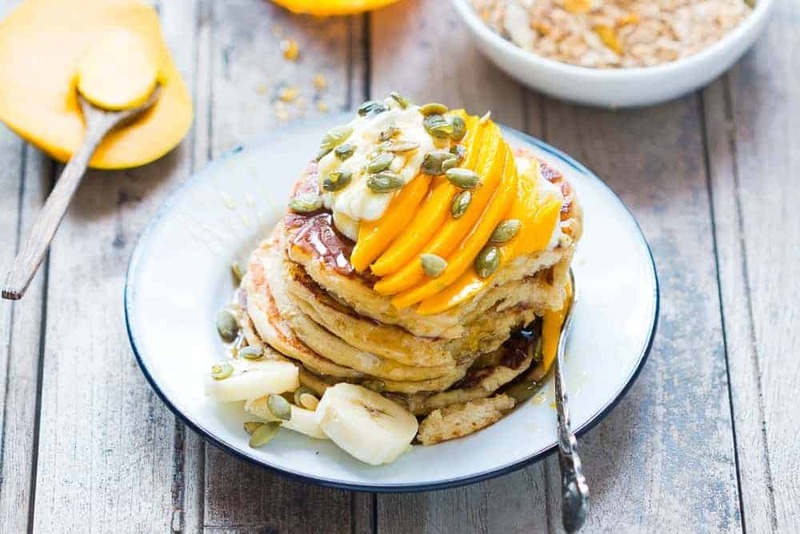 This is an easy and delicious breakfast!